Nothing spectacular for most folks, but the Flying T now has its own Facebook page. Please stop by! Winter storm Nemo is just starting to arrive. The ducks don’t seem to mind. Captions are welcome in the comments section below. Fall was spectacular this year, and though we got a light dusting, we didn’t have a repeat of the Halloween snowstorm of 2011. 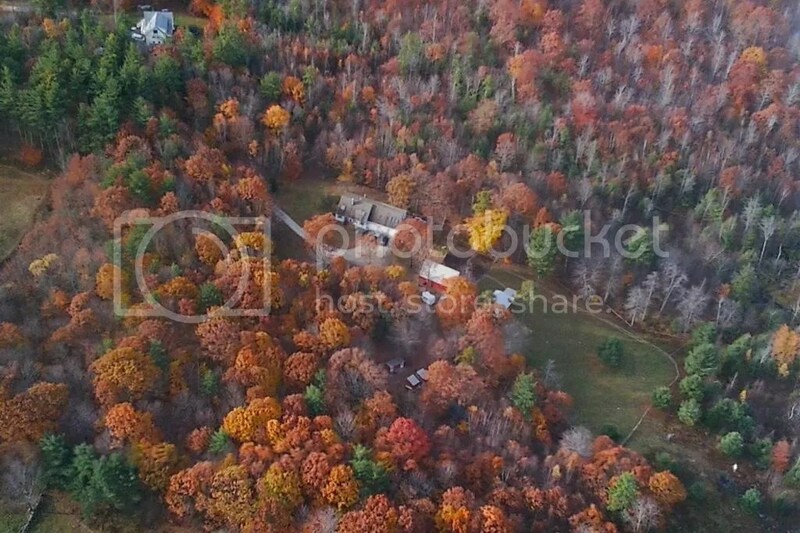 Here’s a pic of the Flying T in late fall from the air. 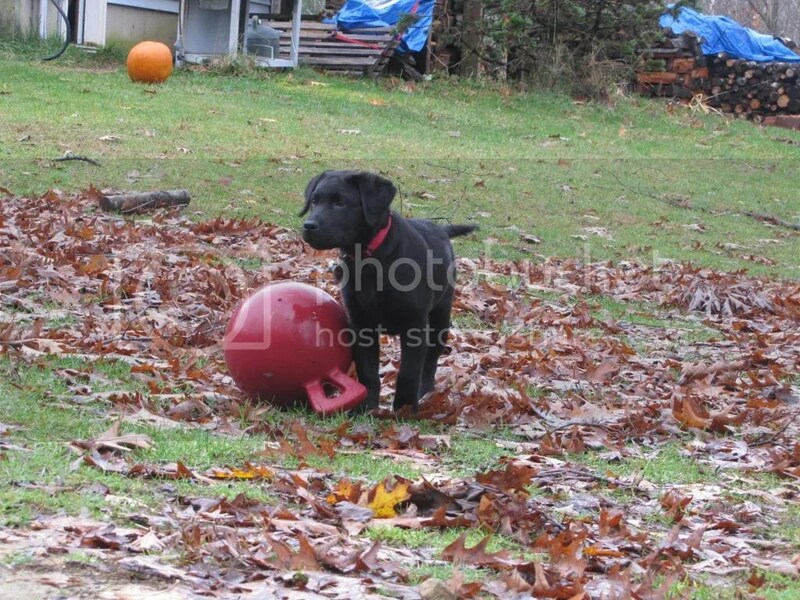 The beginning of Fall also brought some new additions to the Flying T. One is “Rocky,” our new black labrador puppy. He’s growing fast, and has made friends with just about everybody except the house cat. 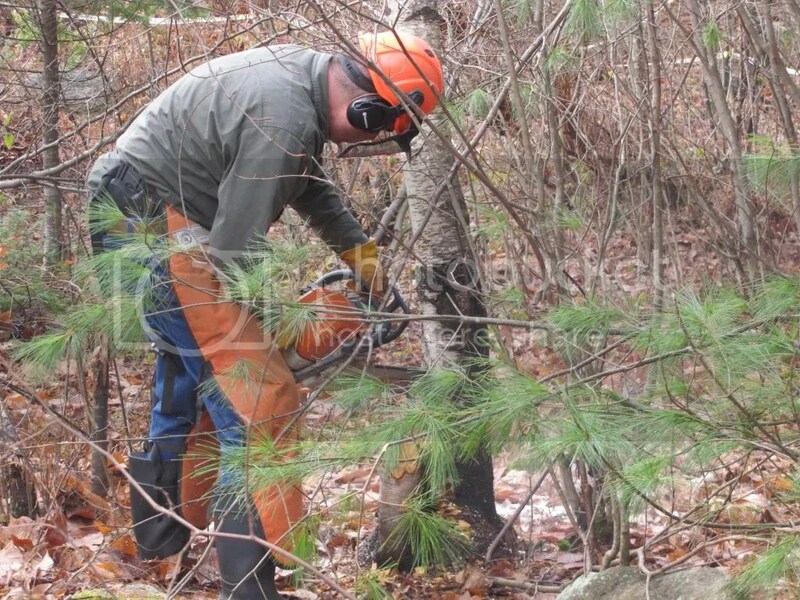 Fall is a wonderful time of year in New Hampshire – the temperatures are perfect for us, and get us out and moving even more than in summer. 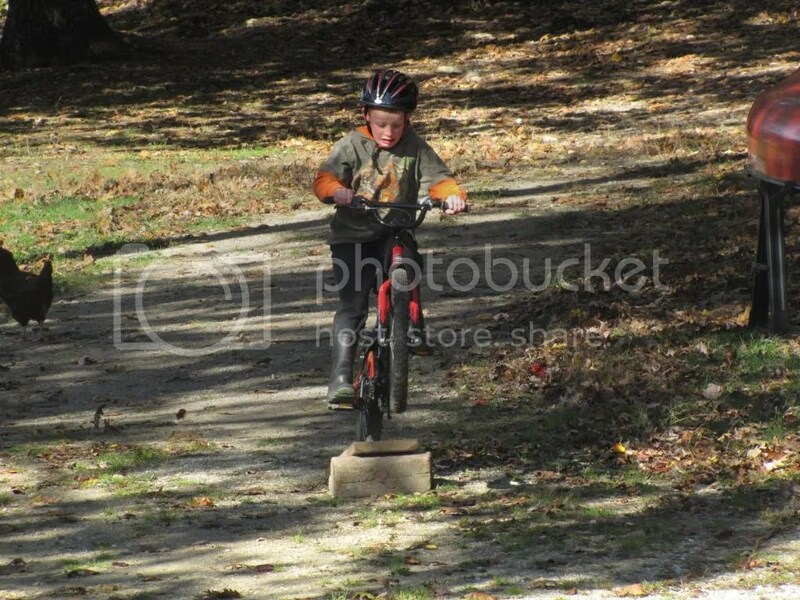 Here’s our son showing off some moves on his bike and a makeshift ramp he put together. 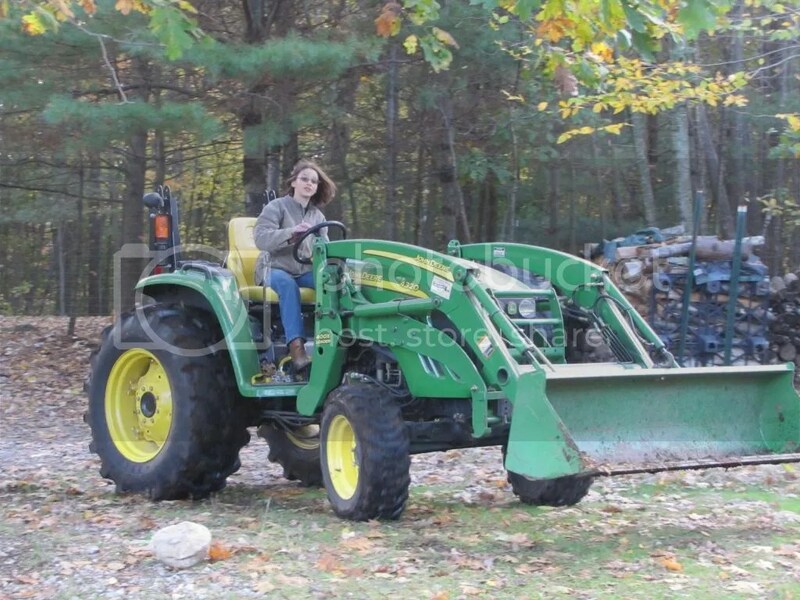 Our younger daughter had a “coming of age” milestone – reaching the age we have determined is the minimum to be allowed to operate the tractor solo. 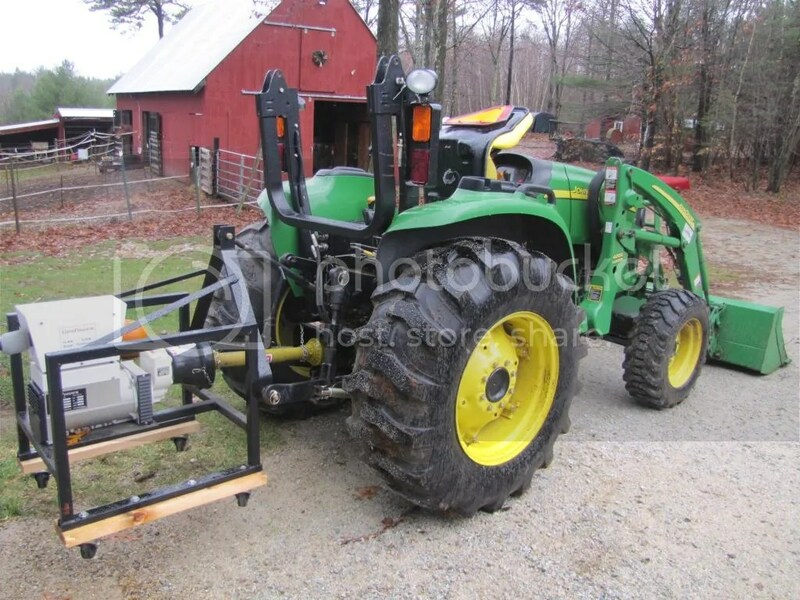 She’s been very proud of her newfound freedom and ability to pitch in to some of the heavier-duty chores. 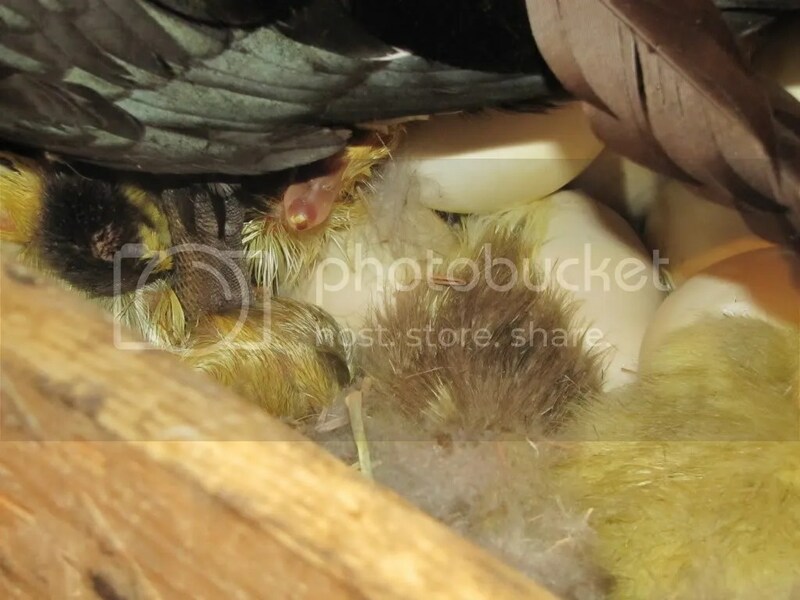 The ducks hatched their last clutches of the season. They were much smaller than earlier in the year. We believe this is due of the loss of our prime drake to a predator a bit before they started setting. With the new arrivals, we also had a few departures. Another duck to a predator, and a hen to a mishap. And then another departure due to sheer meanness. 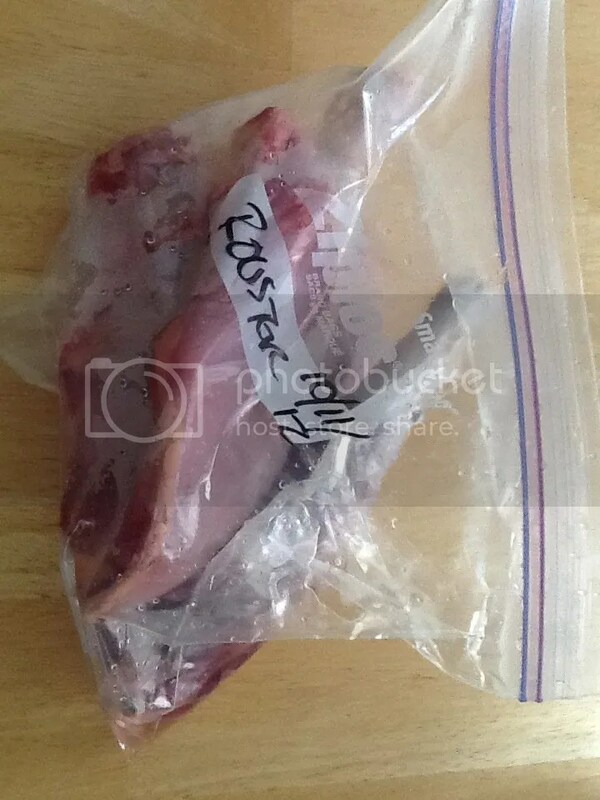 One of the roosters, “Big Daddy Rooster,” attacked the kids one too many times, so he is now at freezer camp. Of course, the big news for the region was Hurricane Sandy. We escaped most of its wrath, though we did lose power for long enough for us to get the PTO-driven generator running. Our biggest need for power is to run the well – the horses alone go through about 30-40 gallons a day. We found by running it only a few hours a day, we could replenish water supplies, get the family through the showers, and run a load of laundry. Thanks to all the linesmen and emergency workers who got power back up and running so quickly! The power company also did us a huge favor this summer by cutting down some of the trees that had been threatening the lines (and thus our road and driveway also), so we had little cleanup to do post-Hurricane. However, since I was told to stay home from work, the chainsaw still got some work as we got back to clearing more of the back pasture. http://fema.apps.esri.com/checkyourhome/ (Zoom in about 3 clicks until you start seeing green dots around the NYC area. 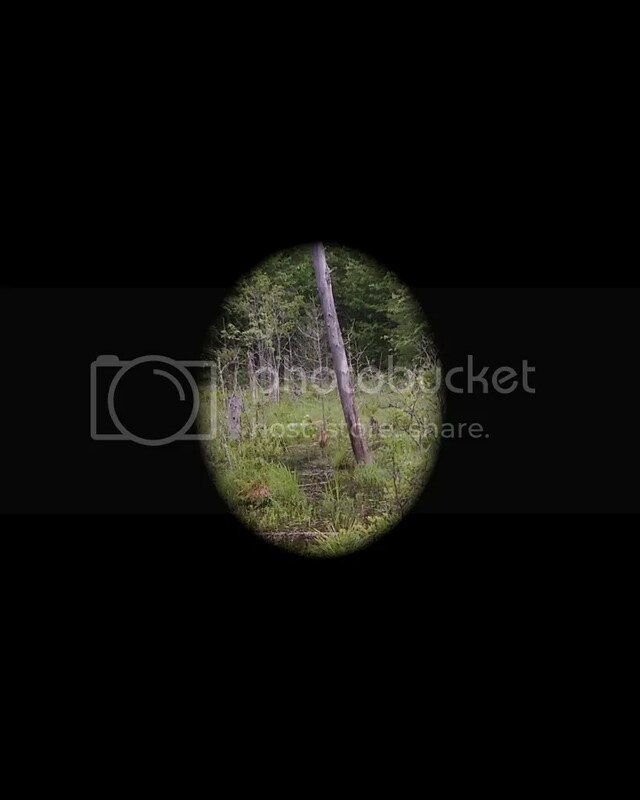 Each of those is a photo). 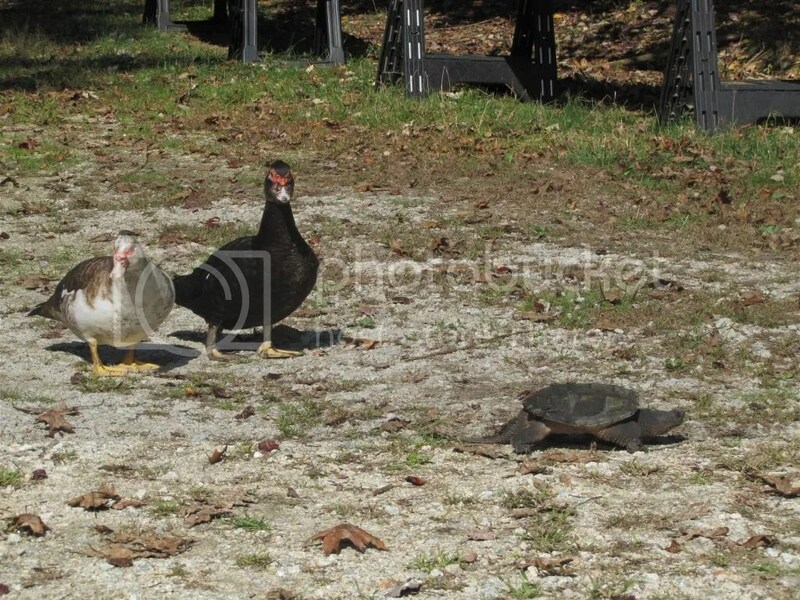 And so, as the fall winds up and the winter starts to move our way, we’re finishing up our preparations… just like this snapping turtle who two of our ducks escorted off the premises on her way to hibernation. Hopefully it won’t be too long before we can post again! Blessings to all of you as we approach this season of Thanksgiving (though every day ought to be a time to be thankful)! 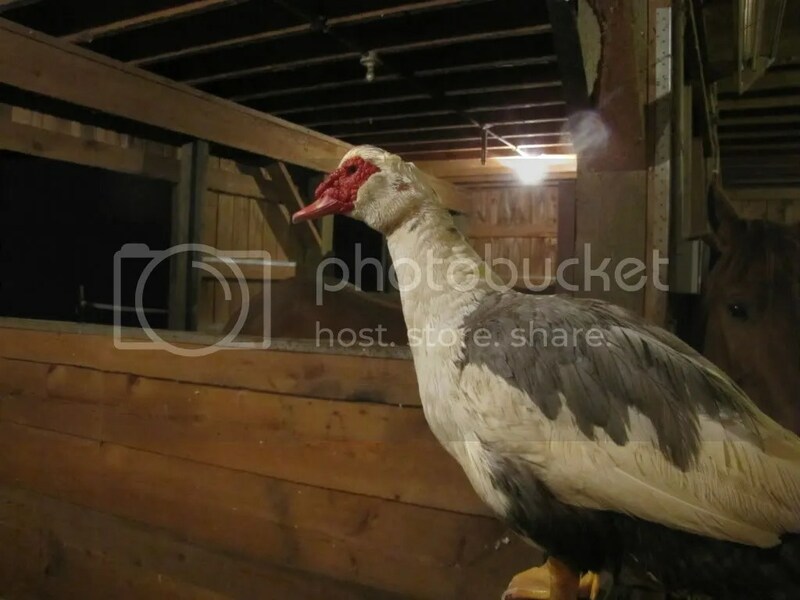 A while back, one of the kids wrote a blog post about “Chuck the Chicken Duck,” one of our Araucanas who felt more comfortable with the ducks than her own flock. 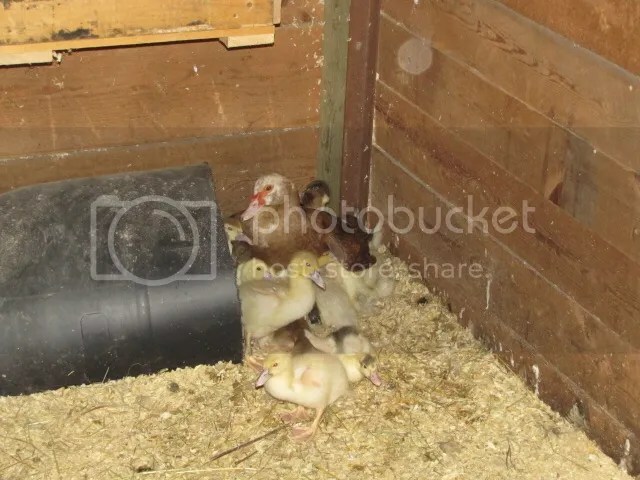 Today as we were cleaning the barn stall the ducks stay in at night, we found Chuck inside. 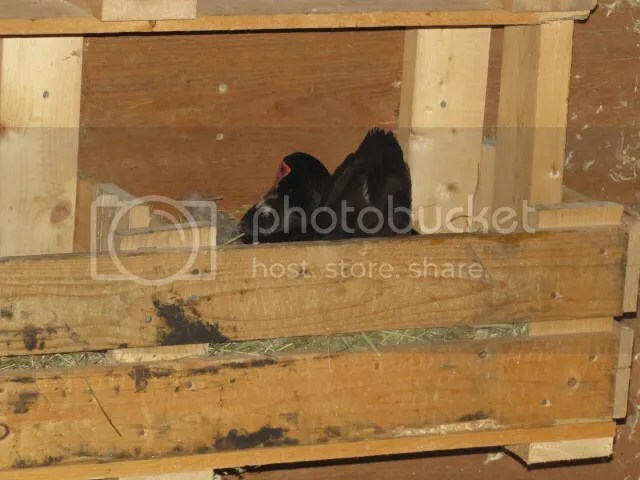 Normally, she lays her daily egg in one of the nesting boxes. However, Midnight started setting yesterday (Katy has already been setting in the other box since the beginning of the month), so now both boxes are occupied. We tried to shoo Chuck out the door to keep her from disturbing them. Every time we did, she ran back in, or flew over the door or stall wall. She was very determined, and agitated that she didn’t have a place to lay her egg. We finally gave up, figuring that the ducks would scare her away and Chuck would find somewhere else. The ducks are quite grumpy when setting, and aggressive at driving intruders away. 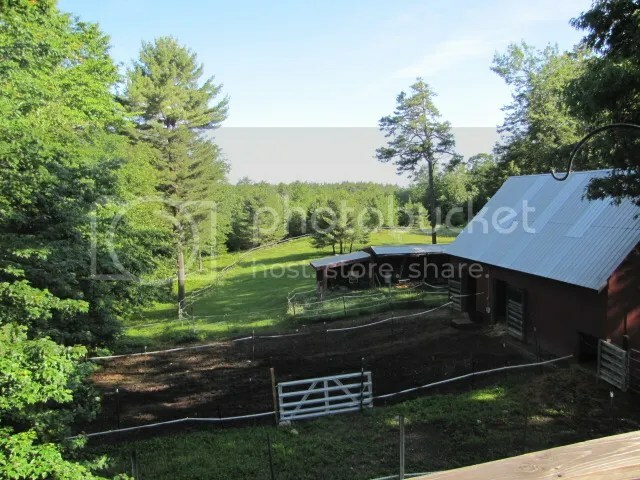 Summer is arriving at the Flying T. Here are some recent pics that tell a story about what that means on the farm. It’s been really rainy lately, but today we have a good bit of sun… just in time for our son’s baseball game! The ducklings are now a month old. 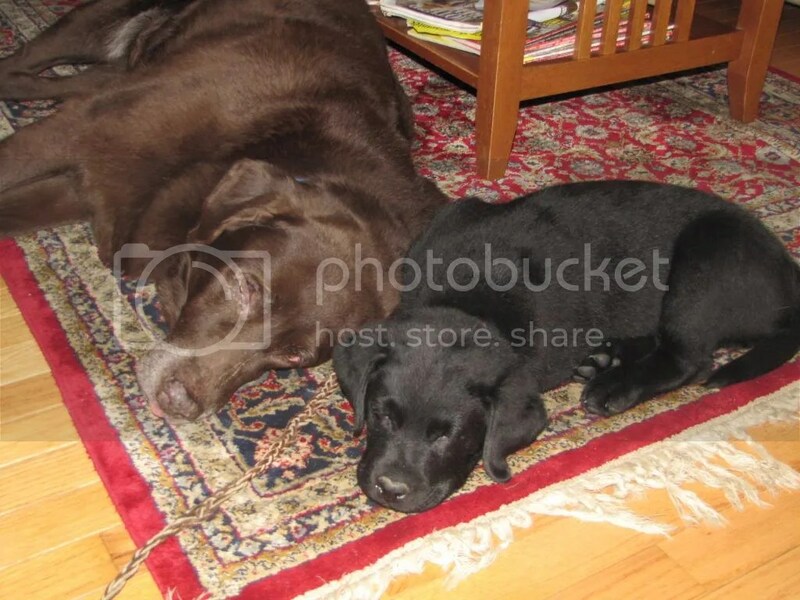 Just before the three week point, one of the other ducks (Mocha) adopted them as her own. Unfortunately, this meant that she stepped off her own nest a week early, so we lost a clutch of 20. 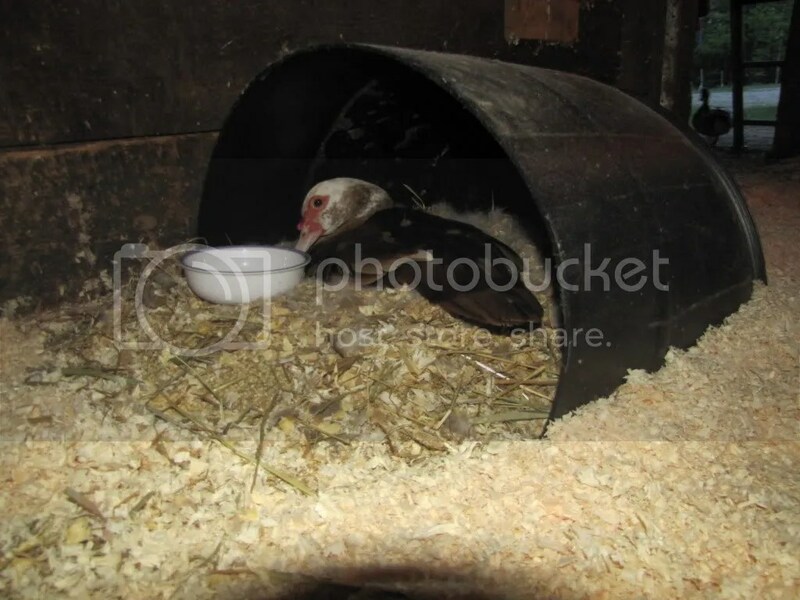 However, she has been a great mother, and guards over them dutifully so that they can eat, drink, and swim… and take naps in the sunlight outside the barn. For the past week, Mocha has been bringing the brood on a field trip each morning down to the beaver pond. They spend most of the day there, swimming and eating bugs and weeds, then waddle back to the barn in the afternoon. Try to find her if you can… this pic was taken with my phone, so the resolution isn’t the best. Once you think you’ve found her, look below. 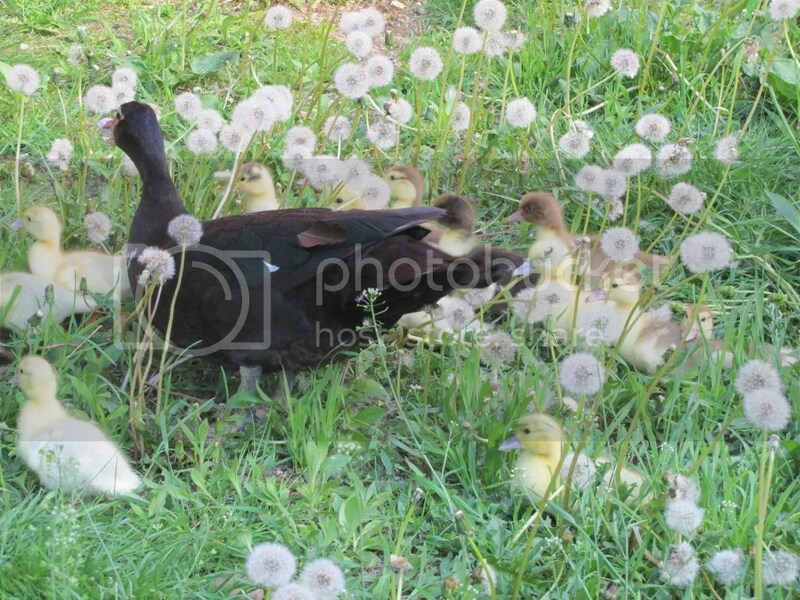 You should be able to imagine Mocha’s blurry brown and white form with a mass of ducklings swimming in front. There also is a brood of wild Mallards sharing the pond, and we’re hoping that another of our Muscovy hens, Sunset, is sitting on a clutch hidden nearby. 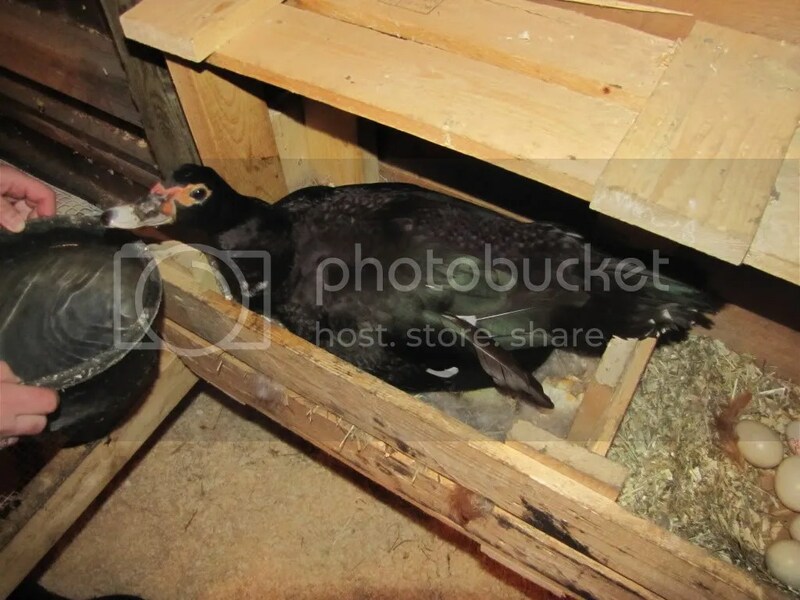 Katy was the next to start her nest in the barn. She’s been on for about a week, so about 27 days left in her vigil before the peeps start happening. Summer means that the grass is growing quickly, especially with all of our rain. This gets the horses frisky. 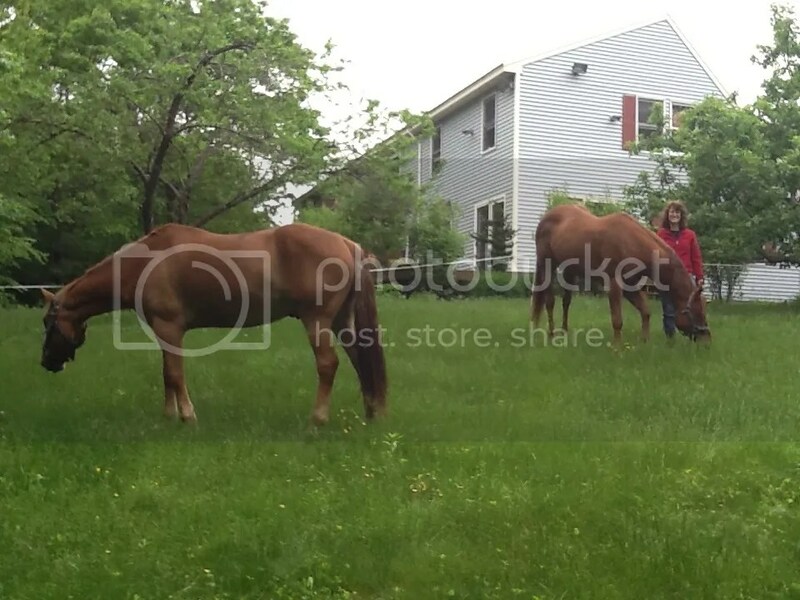 The grass has been too wet to mow around the house, but with a bit of help from the temporary electric fence we use when trailering, we found a greener solution to the lawnmower. Still, there’s plenty of work to be found. 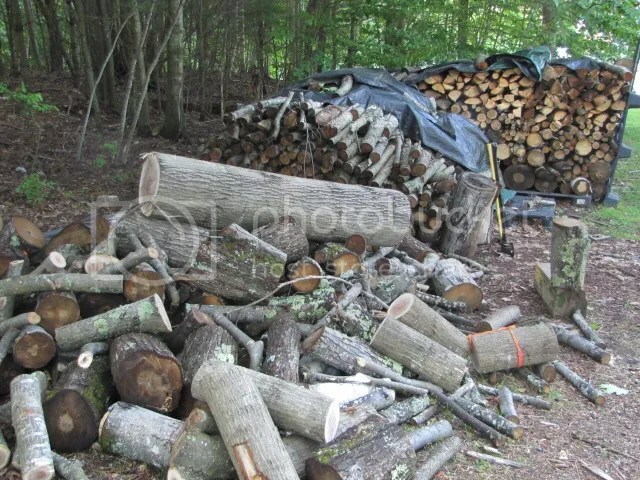 I’m a bit behind in putting away wood. The good thing is that we have a good bit left over from last year. 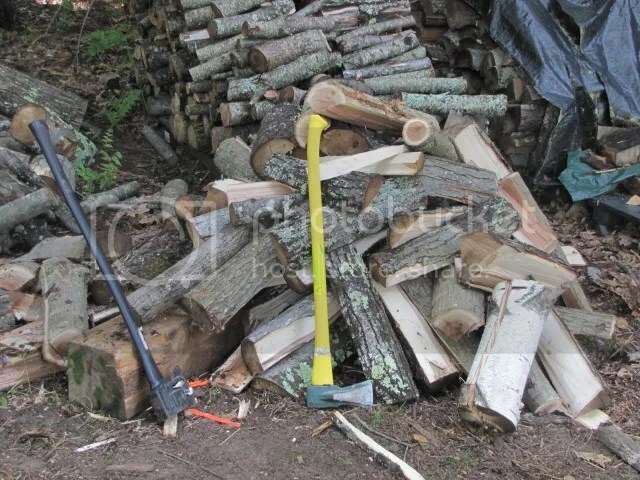 Here’s the current pile I need to split, and I’ve got another cord lying in the woods right now waiting for me to cut into logs and drag out. After an hour or so of work, I’ve got a good pile of cut wood waiting for the kids to start stacking (and still a whole lot more to split)! 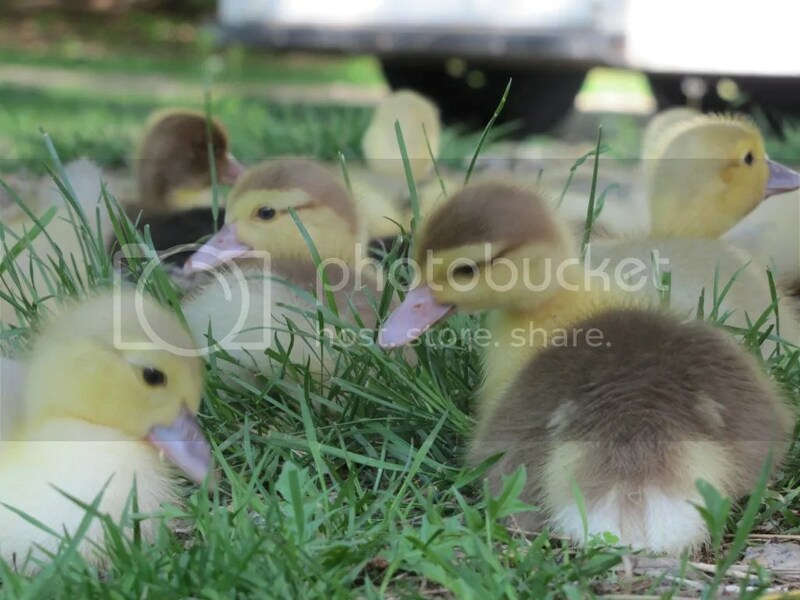 The ducklings hatched one week ago, and their rate of growth is impressive. 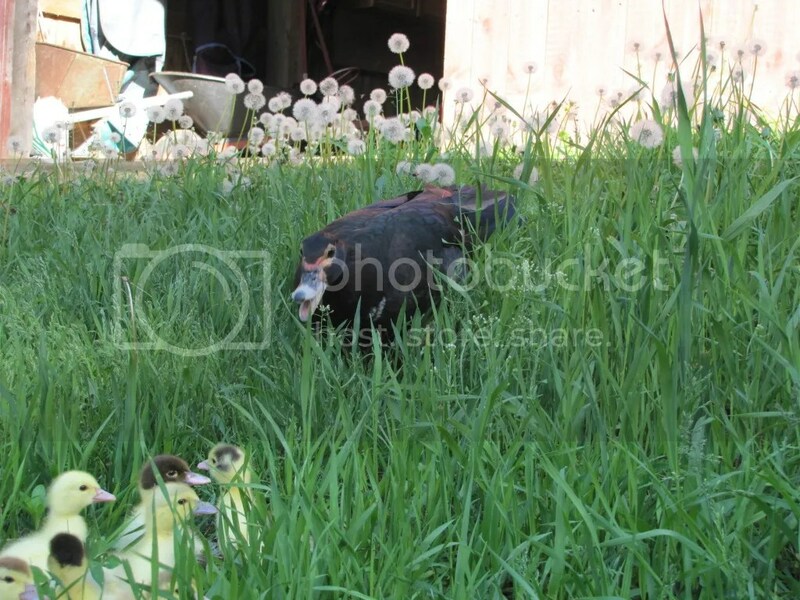 Here are photos from yesterday, when Midnight took them for their first field trip to the dandelion patch just outside the barn. Midnight leads her brood of 17. She seemed to be quite happy to get out as well, snapping at insects and sampling vegetation. 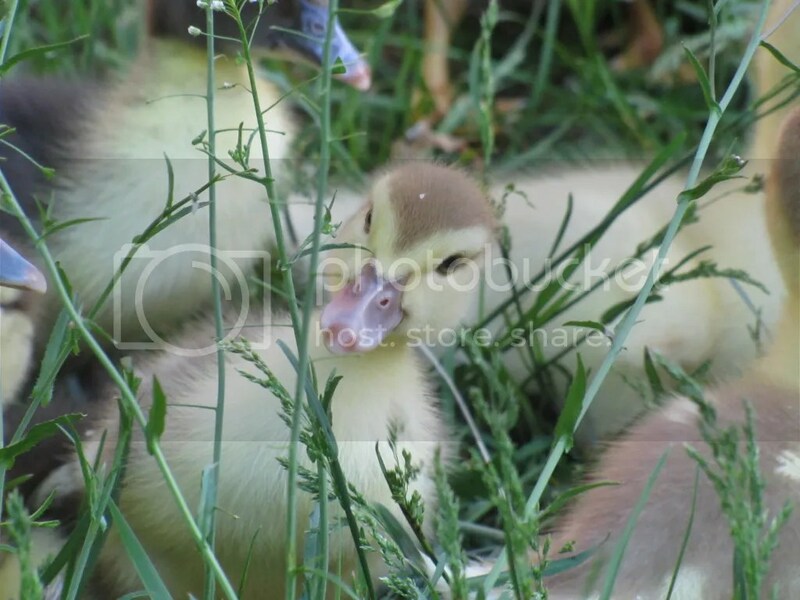 The grass looks a lot taller when little ducklings are in the middle of it! 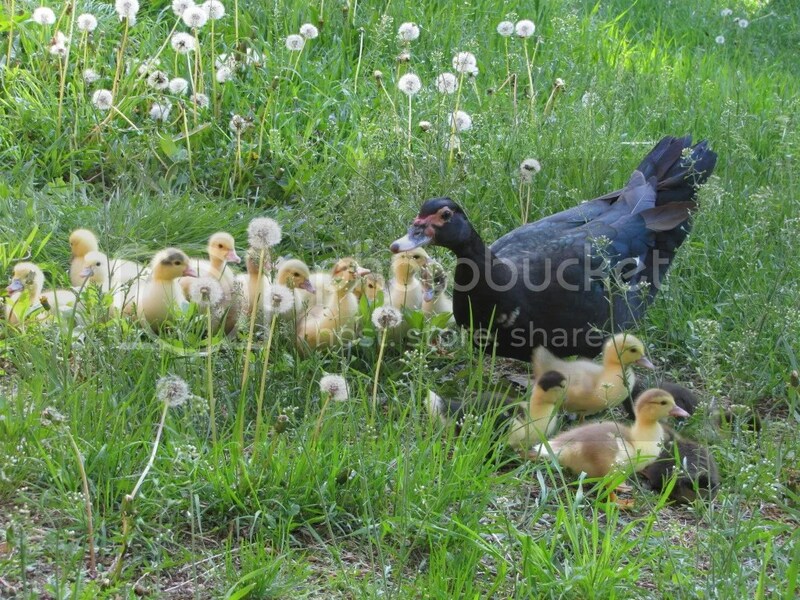 The ducklings enjoyed their first nibbles of grass and dandelions. 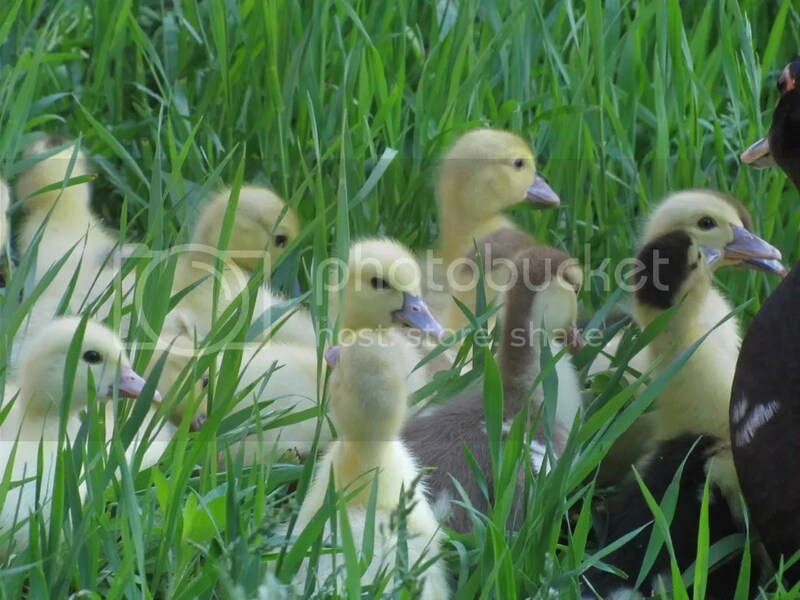 Duckling fuzz proves to be effective camouflage among dandelions. All this sight-seeing is tiring. 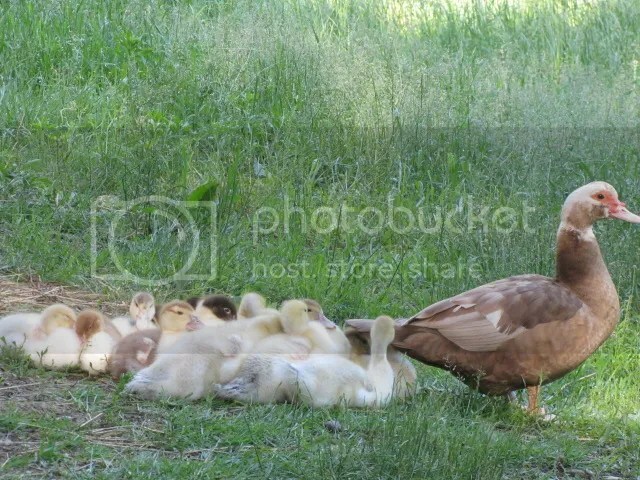 Ducklings stop for a rest. 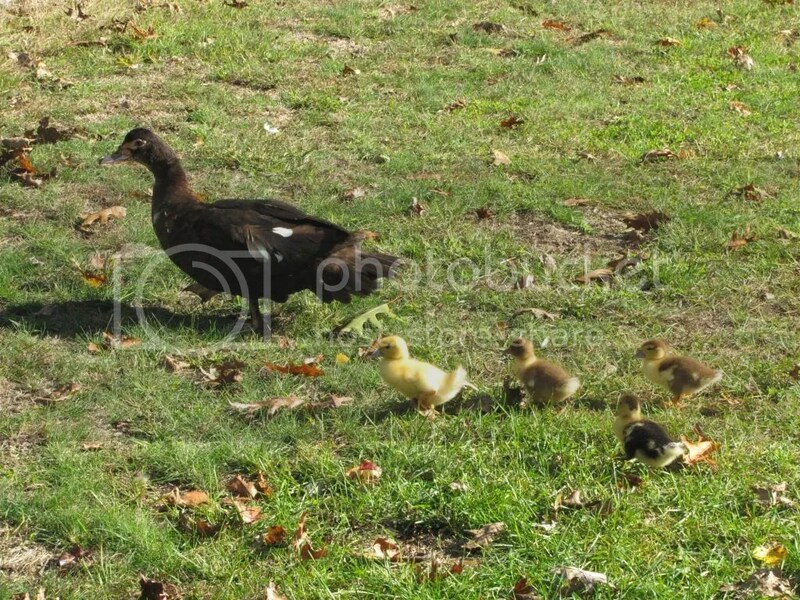 With the field trip over, the ducklings were a bit slow to follow, so momma duck did a little chastising. Does this spark any early memories of your own field trips or vacations? If so, please leave a comment – we’d love to hear about your adventures. Thanks for visiting, and please stop by again soon. We’ll keep you updated as God continues to bless us! P.S. The kids discovered this morning that Midnight is already starting her next clutch! Spring is the season of new life. After the long harsh winter (well, not this year! 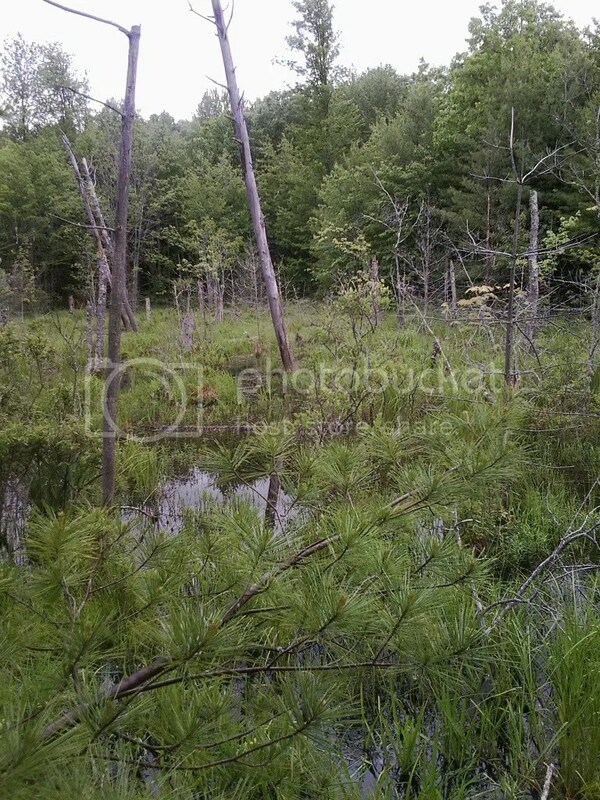 ), the ground thaws, the trees bud, and most animals begin to raise their new young. 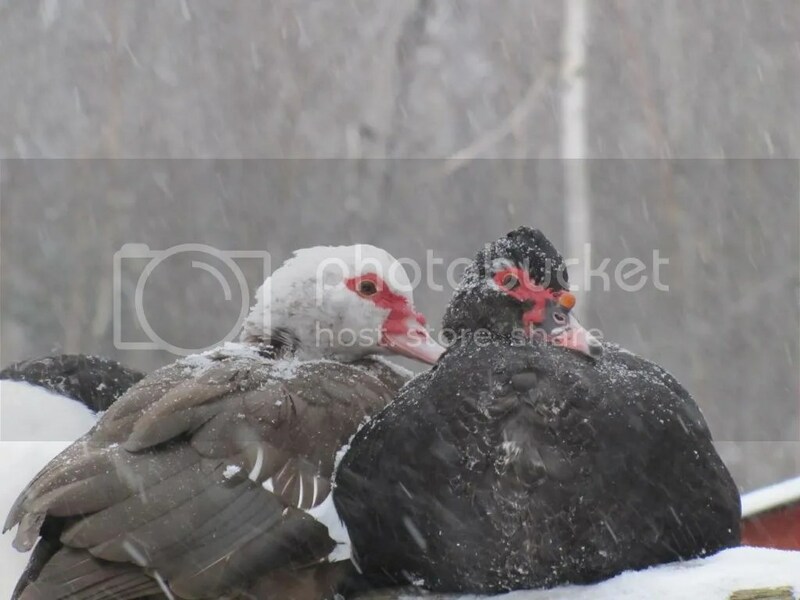 This week, a bit late in the spring, brought the first births from the livestock at the Flying T, courtesy of our flock of Muscovy Ducks. 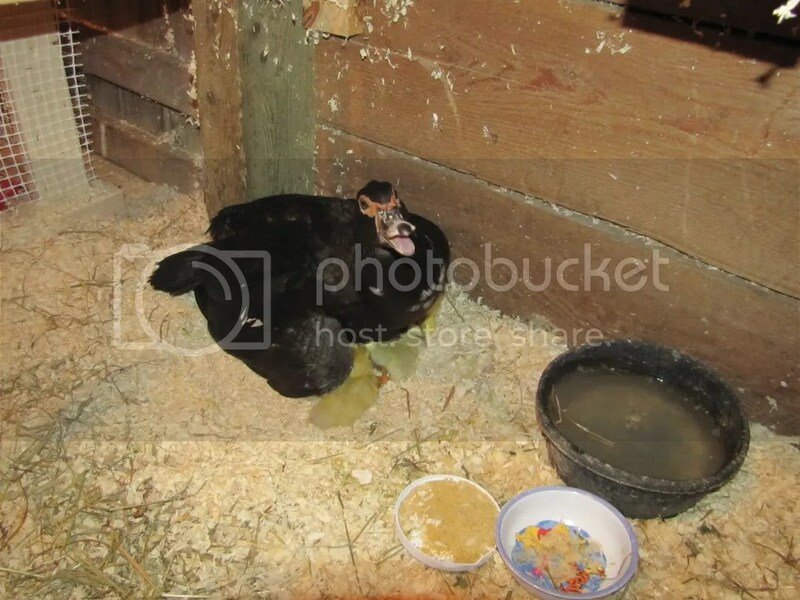 Midnight was the first of our flock to begin sitting on a clutch of about 20 eggs in the second week of April. 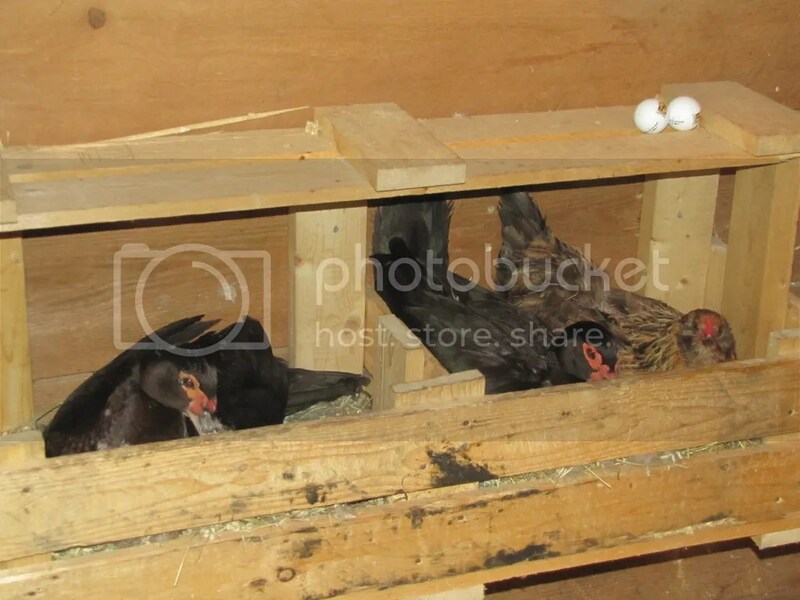 It is quite likely that those eggs are not just hers, but those of some of the other hens, as the ducks will lay an egg over the course of a week or so before sitting on them. Other ducks often are stimulated by the sight of those eggs to lay their own in the same place. 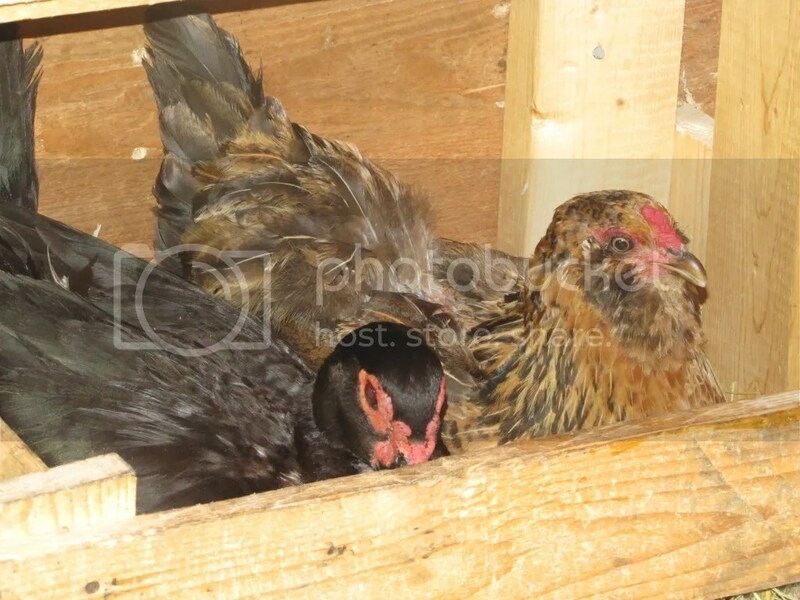 In this case, they chose to lay in one of the nesting boxes I made out of recycled pallets. The eggs don’t begin to develop until she sits on them for an extended period of time. Once she does so, she will stay on the nest for the next ~35 days straight, leaving only for a short time each day for food and water before returning to incubate and guard her clutch. Our kids often helped her to minimize this time by offering food and water to her in the nest. Anticipation grew at the Flying T as the time neared, and early this week the kids ran in from their morning chores to announce excitedly that the hatch had begun. “We can hear the eggs peeping!” one of our daughters exclaimed. The hatch took a while – duck eggs are thick and it is quite an athletic feat to break out from one – but in a bit more than a day we were rewarded by the sight of new yellow fuzz: Doc, our drake, was wise enough to observe from a distance while remaining wary of Midnight’s wrath and warning hisses when he got too close. Zip the quarter horse would also lean over from time to time to see what was going on. 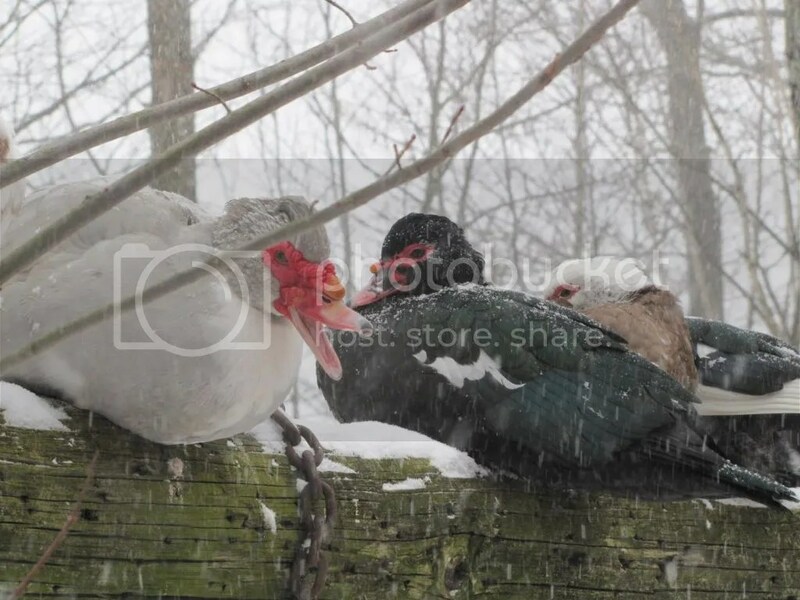 Muscovy Ducks are the best mothers of the domestic varieties, but after a bit over two days, Midnight decided that no more time could be spent hatching – the ducklings needed food and water. Two ducklings were still slowly pushing their way out, but life is not always fair. 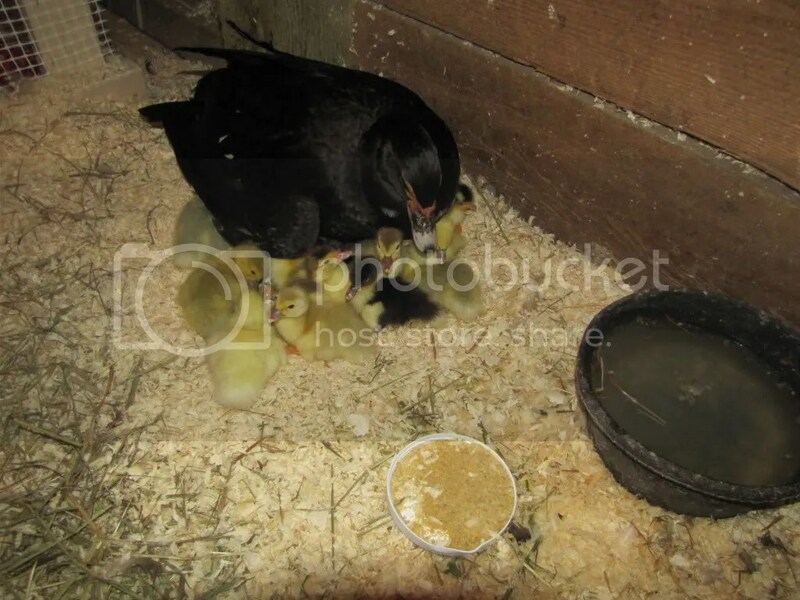 Midnight very purposely smashed the remaining two hatching ducklings, then pushed her brood down to the stable floor, maintaining a protective umbrella over them as they adapted to the new world. 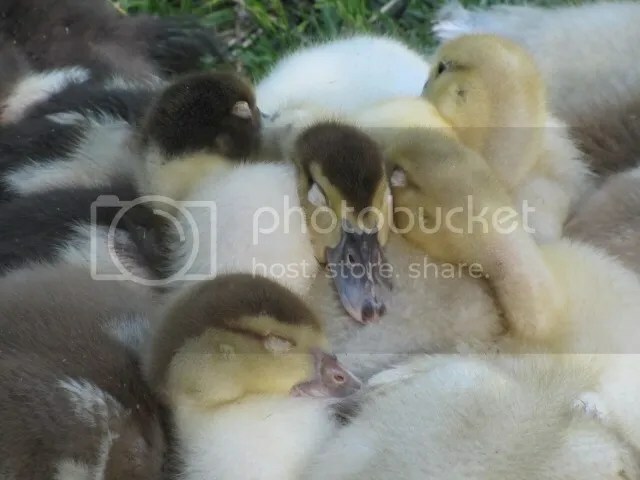 Soon, the young ducklings braved the light and began moving a short distance away to eat and drink, and we were finally able to count them all – 17 birds in a variety of patterns. We’re very excited to see what colors they develop! And… in a few weeks, we’re expecting the next brood from Mocha, who earlier in the month chose one of the quartered poly drums I salvaged as the site for her nest.